This article describes a newly developed method by TM Induction Heating for induction heating devices. It increases the quality of heating metallic workpieces that form a closed round shape with a central opening (bearing, gears, etc.). Throughout the entire warming process, both the temperature of the inner and outer regions are continuously monitored. Control power is adapted to insure an optimum temperature differential, negating workpiece damage due to residual stress. Classic induction heaters control the heating process by monitoring only the temperature of the inner region (bearing inner ring). Temperature of the outer ring is neglected. This runs the risk that the two rings will not expand evenly (see fig. 1). If the inner ring heats too rapidly in relation to the outer ring, large mechanical stresses between rings and roller elements will occur. Damage related to cracks, fractures, or pitting may go unnoticed, reducing the life span of the product. One possible method to control this is, is to heat the product in a controlled ramp mode. Experience and careful attention are required to make sure the process differential is within allowable specifications. Differences in workpieces make this method difficult and inappropriate in most situations. In view of increasing quality demands on the world market, TM Induction Heating has developed the Two Sensor Mode to solve this problem. 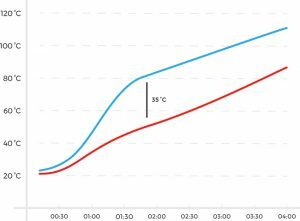 Not only the inner region, but also the outer region temperatures are monitored with a corresponding power adjustment to maintain the optimal expansion ratio. 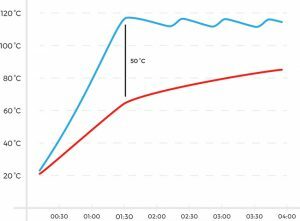 The new SURETHERM heaters provide the operator with a digital readout and graph representation of the heating process throughout the entire cycle (see fig. 2). 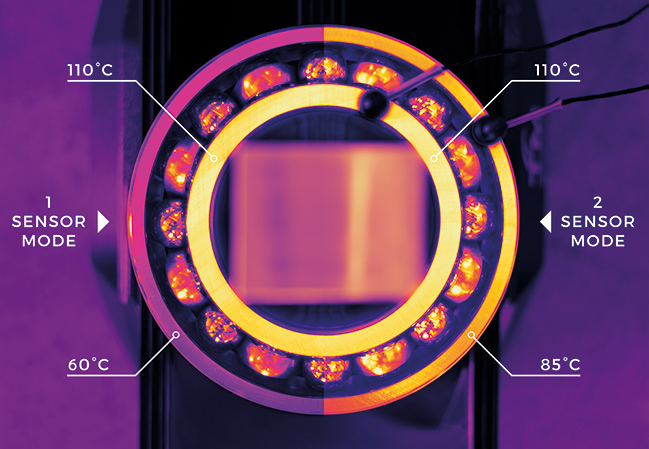 This innovation has proven to lead to increased operating life and allows for documented process quality control, ensuring the optimal ratio of heating time and power consumption.